The canoe was a principal means of travel in ancient Hawaiʻi. Canoes were used for inter-village coastal and interisland travel, while trails within the ahupuaʻa provided access between the uplands and the coast. Most permanent villages initially were near the sea and sheltered beaches, which provided access to good fishing grounds as well as facilitating canoe travel between settlements. At about the same time of Christopher Columbus crossing the Atlantic to America (he was looking for an alternate trade route to the East Indies,) Piʻilani was ruler of Maui. According to oral tradition, Piʻilani unified the entire island of Maui and ruled in peace and prosperity, bringing together, under one rule, the formerly-competing eastern (Hāna) and western (Wailuku) multi-district kingdoms of the Island. Ancient trails facilitated trading between upland and coastal villages and communications between ahupuaʻa and extended families. These trails were usually narrow, following the topography of the land. Sometimes, over ʻaʻā lava, they were paved with waterworn stones (ʻalā or paʻalā). Pi‘ilani died at Lāhainā and the kingdom of Maui passed to his son, Lono-a-Piʻilani (Lono.) Pi‘ilani had directed that the kingdom go to Lono, and that Kiha-a-Piʻilani (Kiha – Lono’s brother) serve under him in peace. In the early years of Lono’s reign all was well … that changed. Kiha connected the entire island with a network of trails to aide his people in their travels which gave him quick access to all parts of his kingdom. Four to six-feet wide and 138-miles long, this rock-paved path facilitated both peace and war. It simplified local and regional travel and communication, and allowed the chief’s messengers to quickly get from one part of the island to another. The trail was used for the annual harvest festival of Makahiki and to collect taxes, promote production, enforce order and move armies. By the middle-1820s, significant changes in the Hawaiian Kingdom were underway. The missionaries, who arrived in April 1820, selected key stations generally coinciding with the traditional Royal Centers, which by this time, were also developing as trade points with foreign vessels. The development of trails to western-style roadways was initiated to facilitate access to mission stations, landings, and key areas of resource collection. Until the 1840s, overland travel was predominantly by foot and followed the traditional trails. 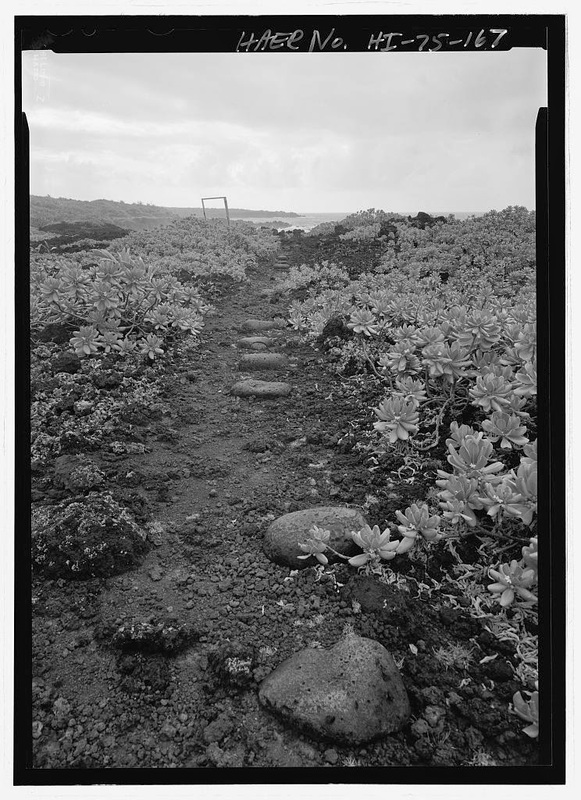 By the 1840s, the use of introduced horses, mules and bullocks for transportation was increasing, and many traditional trails – the ala loa and mauka-makai trails within ahupuaʻa – were modified by removing the smooth stepping stones that caused the animals to slip. Eventually, wider, straighter trails were constructed to accommodate horse drawn carts. Unlike the earlier trails, these later trails could not conform to the natural, sometimes steep, terrain. They often by-passed the traditional trails as more remote coastal villages became depopulated due to introduced diseases and the changing economic and social systems. Sometimes, the new corridors were constructed over the alignments of the ancient trails, or totally realigned, thus abandoning – for larger public purposes – the older ala loa. In addition to these modifications in trail location and type due to changing uses, trails were also relocated as a result of natural events such as lava flows, tsunami, and other occurrences. The Hawaiian trail system was and will remain dynamic. By the early 1850s, specific criteria were developed for realigning trails and roadways, including the straightening of alignments and development of causeways and bridges. This system of roadwork, supervised by district overseers, and funded through government appropriations – with labor by prisoners and individuals unable to pay taxes in another way – evolved over the next 40 years. With the passing of time, emphasis was given to areas of substantial populations. Because of the on-going decline of the Hawaiian population, and the near abandonment of isolated communities formerly accessed by the ala loa and earlier alanui aupuni, segments were abandoned. In the later years of the Hawaiian monarchy, the need to define and protect Hawaiian trails and roadways was recognized, particularly in support of native tenants living in remote locations. Often these native tenants` lands were surrounded by tracts of land held by single, large landowners who challenged rights of access. In 1892, Queen Liliʻuokalani and the Legislature of the Kingdom of Hawaiʻi signed into law an “Act Defining Highways, and Defining and Establishing Certain Routes and Duties in Connection Therewith,” to be known as The Highways Act, 1892. The image shows a portion of the Kings Highway footpath showing rounded rocks laid into lava bed (LOC.) In addition, I have added other related images in a folder of like name in the Photos section on my Facebook and Google+ pages.